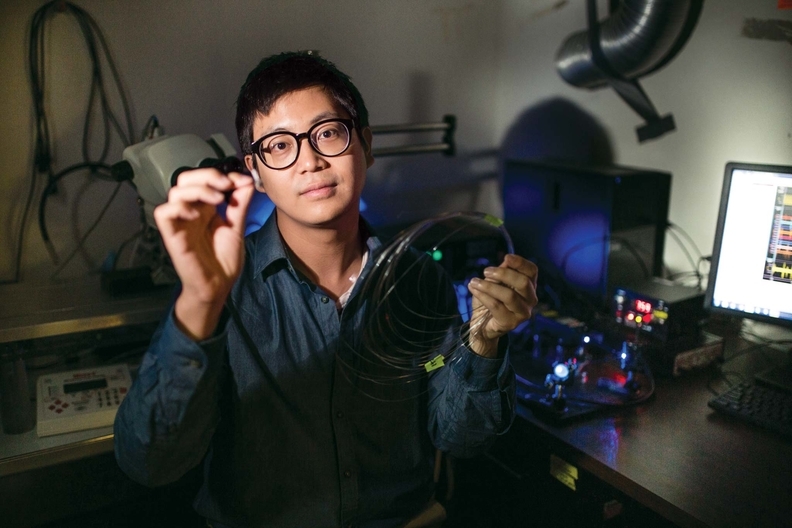 Graduate student Seongjun Park holds an example of a new flexible fiber that can deliver optical, electrical and chemical signals back and forth into the brain. The hairs on top of your head, while aesthetically pleasing, serve no function as critical as the hair-like fibers that could soon be inside your head. For the first time, a single multifunction, flexible fiber no bigger than a human hair has successfully delivered a combination of optical, electrical and chemical signals back and forth into the brain. The technology gives researchers a significantly better way to study how different parts of the brain function and connect. The idea was first proposed two years ago, but a team of 10 material scientists, chemists and biologists at MIT and elsewhere have developed the fibers and reported their results in a paper by MIT grad student Seongjun Park in the journal Nature Neuroscience. The fibers were designed to mimic the softness and flexibility of brain tissue, hopefully making it possible to leave implants in place and have them retain functionality much longer than with traditional metallic fibers, and enable more extensive data collection. The team at MIT demonstrated that all the functions required for this type of research can be performed by a single flexible fiber just 200 micrometers across. Since the fibers are so small, “potentially we could use many of them to observe different regions of activity,” said Polina Anikeeva, a professor in MIT's materials science and engineering department. The fibers are possible because of the development of conductive “wires” that maintained the needed flexibility while still carrying the necessary electrical signals. The team engineered a composite of conductive polyethylene doped with graphite flakes. The polyethylene was formed into layers, sprinkled with the graphite flakes, then compressed. The process was then repeated many times, a method that increased the conductivity of the polymer by a factor of four or five allowing the size of the electrodes to be reduced by the same amount.